Early this year, Ghibli published a comprehensive volume called, plainly, Studio Ghibli Book List. 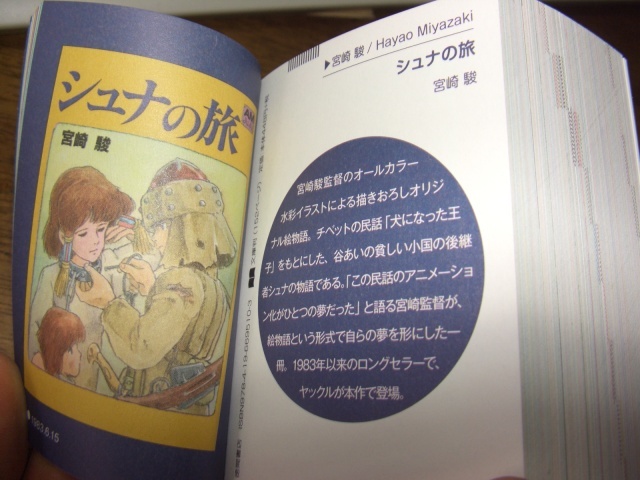 It's a listing of every book published in relation to Hayao Miyazaki and Isao Takahata's long careers. Included are art books, film comics, and manga. This yearly volume includes the vast catalog of works published before Ghibli's founding; it appears that, slowly but surely, the entire works of the old masters are being brought into the fold. 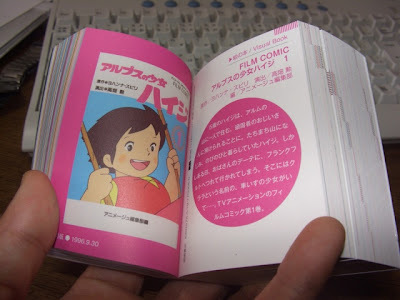 It would not be surprising to one day hear the word "Ghibli" as a rough slang for the entire Takahata/Miyazaki canon. I'm still looking around for a site where I can buy a copy. This is a very small book - 9cm x 7xm x 4cm. If a publisher (such as Viz) ever brought this book to the West, they would definitely have to increase the size. As you can see, the original artwork is included, with a short description. This is a fantastic tool for the diehard fans and collectors. I could see myself going through everything with a highlighter pen, as I track down the final missing elements of the canon. These photos come from the excellent Japanese blog, Whispers From Totoro. It's my new favorite Ghibli-themed website. And I urge all of you to quickly bookmark and scour through the archives. I already do that. The OCD parts of my DVD collection are sorted by director or animation house, and then chronologically; my Ghibli section starts in 1968 with HORUS. If I ever buy HEIDI on DVD, it will probably go there, too, instead of in the TV section. I'm looking to buy one of these too - great reference for when I'm doing book pages over at the GhibliWiki. campaign start from July 14. In this campaign, the mini book "Studio Ghibli DVD/BD/Video list 2010"
is presented to Studio Ghibli DVD and BD buyer. Three mini book already relesed in this year. @paul: Edo-Iki is a godsend for Ghibli Freaks. If I wasn't saving my money for a move to a new apartment this month, I'd already be heavily collecting everything in sight. I'm sure this book will be quite expensive. @beyond: Thank you so much for all your news items. I'll be sure to write formal posts later tonight. As I've said, I'm apartment hunting right now, which involves hiking around Minneapolis for several hours after work. They made it left-to-right reading huh? 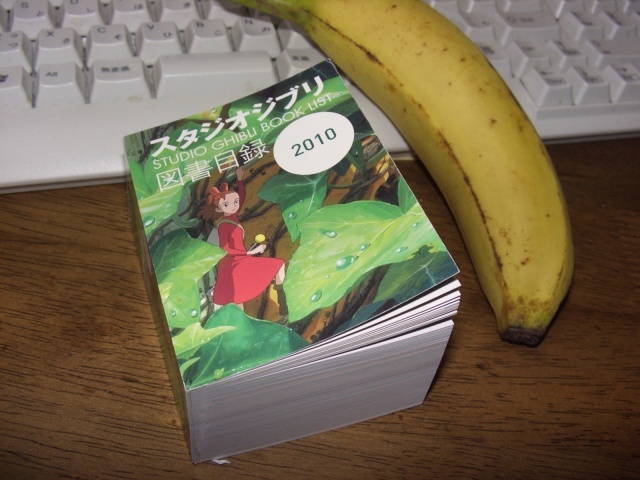 Also the Arrietty mini book 1. That makes me surprised.